The Honorable Michael P. Kenny has now ruled on Sacramento Superior Court case number 34-2008-8000022, better known as the Atherton lawsuit. The basics were discussed here a few months ago. Today's decision is a mixed bag, with some claims ruled in favor of the plaintiffs (Atherton et al.) and others in favor of the defendant (the California High Speed Rail Authority). The CHSRA's Final Program EIR failed to provide an adequate description of the project between San Jose and Gilroy (on or near Union Pacific's right of way adjacent to Monterey Highway) before selecting the Pacheco alignment. Ruling: in favor of Atherton et al. The CHSRA's cost estimates were inadequate and resulted in favoring the Pacheco alignment over the Altamont alignment. Ruling: against Atherton et al. The CHSRA did not adequately consider "train-splitting" as an operational alternative that might make Altamont alignment operate as well or better than Pacheco alignment. Ruling: against Atherton et al. The CHSRA's ridership analysis did not fairly evaluate the Pacheco and Altamont alignment alternatives, and was generally flawed. Ruling: against Atherton et al. The CHSRA's analyses of biological impacts to the Grasslands Ecological Area (along the Pacheco alignment) and the Don Edwards National Wildlife Refuge (along the Altamont alignment) were inadequate, neither equal nor impartial, and lacking in detail. Ruling: against Atherton et al. The CHSRA's analysis of growth-inducing impacts (a.k.a. sprawl) was inadequate for San Benito, Santa Cruz and Monterey counties. Ruling: against Atherton et al. The CHSRA's analysis of noise impacts on the peninsula was inadequate. Ruling: against Atherton et al. The CHSRA's analysis of vibration impacts on the peninsula was inadequate. Ruling: in favor of Atherton et al. The CHSRA's analysis of visual impacts on the peninsula was inadequate. Ruling: against Atherton et al. The CHSRA did not acknowledge the potential for extensive land taking (eminent domain) in peninsula communities. Ruling: in favor of Atherton et al. because of the related Union Pacific issue. The CHSRA's analysis of impact to mature and heritage trees along the peninsula right of way was inadequate. Ruling: against Atherton et al. The CHSRA's analysis of alternatives was improperly biased towards the Pacheco alignment, and improperly determined that Altamont alternatives were infeasible. Ruling: against Atherton et al. The CHSRA improperly omitted the possibility of reusing the existing Dumbarton rail bridge for the Altamont alignment, and overstated the difficulty of constructing the Altamont alignment. Ruling: against Atherton et al. The CHSRA's analysis of alignments along highways 101 and 280 on the peninsula was deficient and improperly eliminated those options. Ruling: against Atherton et al. The CHSRA failed to amend and recirculate the EIR after Union Pacific forcefully reiterated its position that its right of way was not available. Ruling: in favor of Atherton et al. The CHSRA failed to respond to Menlo Park's comment letter. Ruling: against Atherton et al. While the plaintiffs will no doubt spin the favorable rulings on four of their contentions as a big victory, the fact remains that most of their contentions were found without merit, as evidenced by more red than green in the above summary. With Atherton et al. prevailing on this subset, largely on the back of the Union Pacific issue, some questions immediately come to mind. Is the Pacheco Pass alignment being overturned in favor of Altamont? No. The CHSRA must now amend and recirculate its Bay Area to Central Valley EIR, in order to re-certify it under CEQA. The result is still likely to favor a Pacheco alignment, although the CHSRA will need to address in detail how it plans to circumvent Union Pacific's unwillingness to share its right-of-way. Does this ruling stop HSR on the peninsula dead in its tracks? No. At worst, it may delay it a bit, possibly enough to miss the boat on federal stimulus funding. Does this ruling prevent the CHSRA from continuing the San Francisco - San Jose project level EIR work, and will HNTB be told to stop work? Probably not. The work being performed at the project level could just as well be re-purposed to serve the "patching" of the program-level EIR. Tiering under CEQA allows a program-level EIR to be certified prior to project-level detailed work, primarily to relieve the agency preparing the material from having to delve into overwhelming detail too soon. However, that doesn't prevent the agency from going into more detail than is strictly required under CEQA for a program-level EIR, for example by continuing the project-level EIR work currently underway under the guise of fixing the program-level EIR. What happens next? The program-level EIR will be amended, possibly with contingency material already prepared by the CHSRA as part of its project-level work on the San Francisco - San Jose section and especially the San Jose - Merced section, which includes the controversial stretch along Monterey Highway. The Union Pacific issue, now subject of an unrelated lawsuit, must be very high on the CHSRA's risk radar; it is very likely that mitigation of this risk would be well underway if not already completed. Does this create another opportunity to sue? Yes. Once the amended EIR is re-certified under CEQA, there will be another opportunity for lawsuits, one which the increasingly entrenched HSR opposition is unlikely to pass up. Whether the entire EIR is back in play, versus just the amendments, is an important legal question that we won't pretend to answer here. As always, keep in mind this is a blogger writing, not a lawyer. And pass some more popcorn around, will ya? While the city of Palo Alto has of late developed a certain ambivalence towards high speed rail, some residents are taking the planning into their own hands. Taking for granted that high speed rail will come through Palo Alto, a group of civic leaders and architects is elaborating some design proposals that may shape the California High Speed Rail Authority's ongoing analysis of alternatives. The group proposes tunneling the train tracks through the entire 4 mile (6 km) length of Palo Alto, as first described in a Palo Alto Weekly cover story published before the 2008 election. This idea, which would liberate more than 40 acres of land currently owned and occupied by the railroad, has since been fleshed out into an urban design concept entitled Innovation Place. A presentation of Innovation Place earned the group a 2009 urban design award from the American Institute of Architecture California Council. As its creators note, Innovation Place is a collection of ideas rather than a specific project proposal. The remainder of the Innovation Place proposal consists of a 31-acre linear park adjoining Alma Street, featuring a bike and pedestrian path and uniting the two halves of Palo Alto formerly separated by the train tracks. The additional cost of putting the tracks underground would be financed by selling $700 million worth of air rights for development. The feasibility of the Innovation Place concept hinges on the financing for tunnel construction. Will air rights for residential and commercial development really be worth $700 million? Will Palo Alto's famously difficult development approvals process allow the construction of 660 homes and 814,000 sq ft of retail and the elimination of El Camino Park, Palo Alto's oldest public park? Will the incremental cost of tunnels (as compared to simpler track alignments) cost as little as $700 million? These questions remain unanswered, and the technical challenges of building a cavernous four-track high-speed tunnel might not bode well for the cost. On simple grounds of environmental justice, the CHSRA has refused to contribute its own funding for any tunnels that benefit a local community rather than provide added transportation functionality. Instead, it encourages cities to pay for such tunneling costs, as Berkeley did with BART in the 1960s. That scenario might require Palo Alto to pay for the project by taxing itself through an initiative passed at the polls. For such an initiative to have even the slightest chance of passing, the benefits need to be distributed throughout Palo Alto, and not just be focused on the University Avenue area. That is why, out of political necessity, the linear park along the entire length of Palo Alto is a non-negotiable component of the concept. A partial tunnel just won't do. The city of Palo Alto recently set aside $70,000, in large part for hiring an engineering consultant to provide independent review of tunneling plans. The consultant is Hatch Mott MacDonald, a mega-firm with extensive tunneling experience (and one of the key players in San Francisco's Downtown Extension project) that has previously provided advice to the backers of the Innovation Place concept. 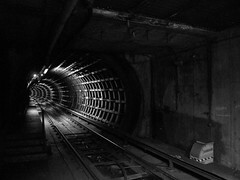 While such a consulting arrangement may be independent of the CHSRA, the firm does have an incentive to show financial feasibility of a tunnel because it may well end up bidding on its construction--a conflict of interest that should be mitigated to obtain the most objective evaluation of tunneling options. Does It All Hang Together? If Innovation Place has a weakness, it is that the concept really consists of two separable elements: the University Avenue redevelopment, and the tunnel / linear park. If Palo Alto were to become a high speed rail stop, the rare opportunity to reconfigure and redevelop the station area would present itself regardless of whether or not the tracks ran in tunnels. Most of the Innovation Place presentation is devoted to this intelligent urban re-design of the University Avenue area, which has great merit on its own. On the other hand, the tunnel and linear park need the University Avenue development in order to make even the slightest bit of sense; otherwise, what's left is a billion-dollar public park, an idea that obviously won't get very far. One of the key features of Innovation Place is an underground station at University Avenue. However, it's worth considering an even wider range of options: this area could just as well be redeveloped without any tunnels at all. Streets on either side of the tracks could be reconnected using regular grade separations. Lytton Street could be connected to the bus depot, El Camino and Quarry Road, improving bus, shuttle and taxicab connections at the train station. If one thing is sure, there is no shortage of architectural possibilities--with or without tunnels. Palo Alto is unleashing its creative talents on how best to weave high speed rail into the fabric of the city. The city will be hosting design "teach-in" on September 12th, sponsored by the Peninsula Cities Consortium. On October 3rd and 4th, the creators of Innovation Place will host a high speed rail workshop geared towards developing solutions and tangible design products for use in the CHSRA's analysis of alternatives, a key document that will be published by the Authority by the end of this year. Legislators, civic leaders, Caltrain and the CHSRA will participate in both events. Whatever quibbles one may have with Innovation Place, it represents a forward-looking vision for Palo Alto and an embrace of high speed rail, rather than a desperate clinging to the past, and for that alone, it is refreshing. Full disclosure: this blogger may participate in these events. Heavy freight trains operate nightly on the Caltrain corridor. "Heavy freight" is characterized by very high axle loads (up to 30,000 kg or 65,000 lb) and very high mass per unit length (up to 7,500 kg/m or 5,000 lb/ft). Today, they are not much of a nuisance and few people notice them, but what will happen when the high speed rail project is built on the peninsula? HSR will bring a lot of changes, but some of them will be attributable to freight more than high speed rail. This is an attempt to tease out the specific community impacts of heavy freight trains. The Caltrain corridor has more than 40 grade crossings, every one of which will be eliminated. Grade crossings can be eliminated either by closing them permanently, or by building a grade separation overpass or underpass, similar to the many grade separations that already dot the corridor. Usually, the easiest way to build a grade separation is to keep the railroad tracks at ground level and detour the road over or under the tracks. In some cases, though, detouring the road is not practical because of nearby residential or business frontage, or major roads and intersections. Those situations are where the railroad tracks must be elevated above or sunk below ground level. Those situations are causing quite a controversy in the communities along the Caltrain corridor, because the HSR project's preference is for cheaper elevated structures. You might think that 125 mph (200 km/h) passenger trains would need very gentle grades and a vertical track profile that is as flat as possible--but you'd be wrong! 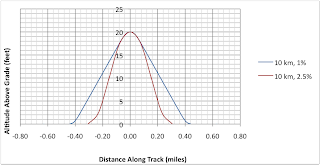 What determines train safety and comfort is vertical curve radius (at that speed, a minimum of 6 miles or 10 km), and not the steepness of the grade. Powerful high speed passenger trains and modern EMU commuter trains planned by Caltrain can easily climb grades that are very steep by railroad standards, like a whopping 3% (i.e. 3 feet up for every 100 feet along the track). It's the heavy freight trains that have difficulty with those grades, because freight locomotives will start spinning their wheels if they attempt to drag a massive train up such a steep incline. That's why heavy freight trains are typically limited to grades of about 1% (i.e. 1 foot up for every 100 feet along the track). Grades any steeper than that require additional locomotives, shorter trains, and cost more to operate. To get the rails up to that height, long sloping approaches are needed on either side of the crossing, forming an elongated hump. If you were to stand close enough to such a hump structure, you would see a retaining wall. What will heavy freight trains do to the design of a typical grade separation rail overpass? They make the approach ramps much longer and greatly increase the area of the retaining wall that neighbors would have in their back yard, as shown in the figure at left, with the vertical scale greatly exaggerated. Walls block sight lines, are themselves ugly to look at, reduce property values, and can attract graffiti and neighborhood blight. Exact values may vary, but the relative percentages will be very close. Smaller walls mean lessened community impact, but heavy freight trains make the walls significantly bigger. The other possible option is to sink the rails under the road. When a grade separation is built under a road that cannot be raised, the railroad tracks must be sunk over 30 feet below the level of the road. That includes clearance for trains, high voltage overhead electrification, and the bridge deck. The resulting trench must be dug even deeper than rail level to account for the foundation of the structure. Once again, to get the rails down into a trench, long sloping approaches are needed on either side of the crossing, forming an elongated sagging profile. Adding a twist, heavy freight trains can be up to three feet taller than regular trains, which requires digging the trench three feet deeper than would otherwise be needed, as shown in the figure at left. On a structure that's 75 feet wide and well over a mile long, that adds up to a lot of extra dirt to remove. Exact values may vary, but the relative percentages will again be very close. Heavy freight trains double the amount of excavation needed for a railroad trench underpass. That may be fine with neighbors because the trains would stay even more out of sight, but since a trench is more expensive, an elevated solution will be preferred. That's right: where a wall might not have been required, heavy freight trains could tilt the balance in favor of an elevated wall. The Churchill Avenue crossing in Palo Alto is a great example where this trade-off may occur to the detriment of the neighborhood. 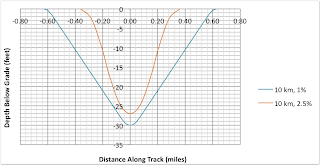 Heavy and long freight trains perform poorly on a track profile that rises and falls across each road crossing like a roller-coaster. Such undulating profiles complicate train handling and can cause hazardous slack action. That's why the grade separations in Belmont and San Carlos are built on a continuous elevated embankment that stretches for several miles, simplifying the handling of trains using the primitive manually operated air brake. In contrast, modern, powerful electric passenger trains with advanced automatic train control systems can glide over these ups and downs without causing their passengers any discomfort. In the manner of an airplane's autopilot, the train's control software automatically adjusts throttle and braking in concert with the vertical profile of the track, which is stored in an on-board database. This capability allows considerably more rise and fall in the vertical profile, which minimizes the extent of elevated structures and thus lessens impact on communities. Heavy freight trains tolerate very little rise and fall and will increase the impact of elevated grade separations because the stretches between grade separations may stay elevated. On sections of track elevated over roads, or open viaducts to allow community access to both sides of the tracks, trains run on what is effectively a bridge. Bridge design depends on the load that will be carried. A good proxy for this load is the linear mass density of the heaviest train, or how much the train weighs per unit of length. The interaction of wheel and rail is an arcane subject that mixes black art with cutting-edge research. It is the stuff of academic journals, so we won't venture out of our depth here. 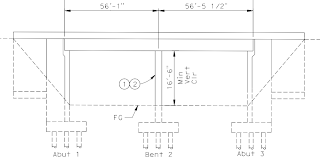 Wheel and rail profiles are typically engineered as a system, in order to achieve a balance of cost, wear, fatigue, and noise characteristics. In a nutshell, as quoted from a journal article, "Lines that handle high-speed passenger trains during the day and freight traffic at night represent the most challenging conditions under which to properly maintain rail and track." Loaded to 30,000 kg per axle (65,000 lb), freight cars can operate with wheel flat spots that measure up to 2 inches in length. The resulting thump-thump-thump is not only loud, but it wreaks havoc on tracks that are carefully aligned for passenger trains. On the peninsula, passenger trains will always outnumber freight trains, and by a vast margin. Is heavy freight worth the extra track maintenance cost, likely to be borne by the taxpayer? Is it worth the additional noise, especially if so much more track will be elevated? While it may initially read like it, the foregoing is not a manifesto against freight. Rail is an environmentally friendly way to move freight on the peninsula, and removes trucks from highway 101. The problem isn't freight per se, but heavy freight. 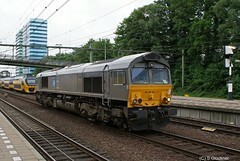 It is possible to operate freight trains with much lighter loads and more compact loading profiles. In other countries, such trains are routinely and safely mixed in with high speed passenger train traffic. American manufacturers like GM and GE export hundreds of light freight locomotives to those countries, so it isn't like this would require any development effort. You can pick up the phone today and order yourself a JT42CWRM (photo at right by CargoFighter), made right here in the U.S.A., and hook it up with freight cars that maybe aren't loaded quite all the way to the brim to keep the weight down. This would be more expensive to operate, but may be worth the enormous savings in capital cost (big structures, more concrete), and especially--most importantly--improved urban design and quality of life in the communities along the Caltrain corridor. There are many ideas about how high speed rail on the peninsula should be "Done Right". For the reasons enumerated above, doing it right means heavy freight should be banished from the peninsula. The benefits are probably not worth the additional cost to communities. 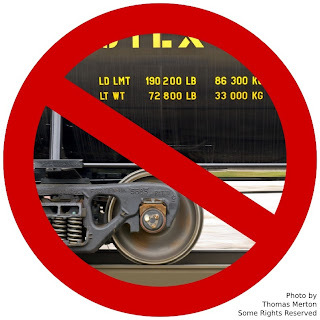 Such a ban would probably enjoy little support from the Union Pacific Railroad, Caltrain, and even the California High Speed Rail Authority and its coterie of engineering consultants, whose U.S.-centric cultural inertia may exceed that of even the heaviest freight train. Are they capable of thinking outside the boxcar? Update 8/11/09: The lawsuit (full text, 4.3 MB PDF) has now been filed in San Mateo County Superior Court, amid a certain degree of pageantry. Original Post: Another lawsuit is brewing at the ground zero of legal action against high speed rail on the peninsula, the leafy town of Atherton. It isn't the first, and will surely not be the last. Famously, the town of Atherton is the lead plaintiff in a lawsuit that seeks to overturn the CHSRA's program environmental certification, which settled upon a route that traverses Atherton via the Caltrain corridor. That lawsuit is scheduled to be decided later this month. On August 5th, the Daily Post revealed in an article that Atherton Menlo Park resident Russell Peterson and his attorney Mike Brady are planning a new lawsuit to prevent any HSR construction from occurring without full compliance under the Union Pacific trackage rights agreement. In November 1991, when the peninsula rail corridor was sold by the Southern Pacific to the Peninsula Corridor Joint Powers Board (the operator of Caltrain), the Southern Pacific (later merged into the Union Pacific Railroad) retained certain rights pertaining to rail operations on the peninsula corridor. See Freight on the Peninsula for an overview of UPRR's peninsula operations. Quite aside from the unanswered questions of exactly who is going to be sued, on what grounds, and whether Peterson even has legal standing to enforce an agreement to which he is not a party, the lawsuit will seek to enlist UPRR's purported rights to slow or stop the construction of high speed rail on the peninsula and through Atherton. Peterson may be trying to provoke UPRR into a dispute with the PCJPB over the high speed rail issue, triggering the Dispute Resolution and Binding Arbitration clauses of Section 7 of the agreement. Mike Brady, Menlo Park, said UP has written four letters to HSR over the years concerning its rights under the Trackage Rights Agreement. He is challenging the legal rights of the JPB to enter into this contract with HSR in light of the existing contract with UP. The JPB represents the citizens of San Mateo County and attention needs to be paid to the detrimental impact of HSR and steps need to be taken to alleviate it. So what's all the fuss about anyway? HSR opponents have made much of the fact that the UPRR agreement contains a clause giving the Union Pacific the right to operate intercity passenger service, as opposed to Caltrain's commuter service. Section 2.7 of the agreement delineates the respective rights and responsibilities of the User (UPRR) and Owner (Caltrain). (a) Owner shall permit User to allow NRPC [Amtrak] Intercity Passenger Service Trains to be operated over the Joint Facilities (except for User's Cahill/Lick Line) in accordance with the terms of the NRPC Agreement in effect as of the date of this Agreement with the understanding that any changes subsequent to the date of this Agreement in Intercity Passenger Service, including but not limited to the number or schedule of Trains, shall be subject to Owner's consent under section 2.7(b) hereof. (b) User may amend its present or any subsequent NRPC Agreement and enter into any new agreements and amendments thereto with NRPC or with any other party for the provision of Intercity Passenger Service over the Joint Facilities (except User's Cahill/Lick Line) with the consent of Owner, which shall not be unreasonably withheld, subject to the provisions of Section 4.3 when Owner dispatches and controls the operations and provided that costs due to any such Intercity Passenger Service agreement, or amendment thereto over the Joint Facilities (except for User's Cahill/Lick Line) and costs of changes necessitated by such agreements affecting line capacity, yard capacity, or the signal system shall be borne by the User. The parties agree to negotiate in good faith with regard to any additional parties that may be engaged or User proposes to have engaged in Intercity Passenger Service. (c) Notwithstanding the provisions of Section 2.7(b) above, no Intercity Passenger Service Trains shall operate on Exclusive Commute Trackage without a written agreement between Owner and User. While it will take lawyers to comb through this and other clauses, Section 8.3.c of the agreement is particularly interesting. This section was likely written to allow for a future BART takeover of the peninsula corridor, in accordance with BART's original plans, but might equally apply to the current plans for the peninsula. Given that Caltrain's plans for lightweight electric trains on a shared HSR corridor would potentially qualify as a "significant change" that is "incompatible" with UPRR freight trains, the PCJPB and CHSRA could conceivably kick UPRR off the peninsula corridor if they wanted to. (However, all signs so far point towards accommodation of UPRR and its freight customers.) In view of the low level of freight service and the strong nationwide push for HSR, it is unlikely that the federal government would oppose or deny such a radical move, if it ever became necessary. With that ace in play, can Russell Peterson succeed in provoking UPRR to take a hard stance on the trackage rights agreement? Among the many interesting things that happened in Berkeley in the 1960s, one of them happens to be relevant to high speed rail on the peninsula: the BART tunnel saga. (tunnel photo by Paul Wicks). The parallels with peninsula communities who desire high speed rail and Caltrain to disappear underground are striking, and indeed oft-mentioned by the California High Speed Rail Authority during community outreach meetings. "You want a tunnel," they say? "Sure, no problem, if you can pay for it just like Berkeley did." The story goes that Berkeley simply ponied up the cash and presto, BART was put underground. In reality, it was an agonizingly complicated and acrimonious process that pitted the city against BART and its engineering consultants in a David vs. Goliath fight. The side of Goliath was led by Parsons Brinckerhoff, the same firm now heading up the California high speed rail project. There is much to learn for peninsula cities whose official preference is that high speed rail be put in a tunnel, a growing list of which includes Burlingame, San Mateo, Atherton, Menlo Park and Palo Alto. The Berkeley tunnel saga was chronicled by historian and political scientist Stephen Zwerling, who published Mass Transit and the Politics of Technology in 1974 (ISBN 0-275-08390-0). This book is no longer in print and has become quite rare. A few examples are available at public libraries in San Jose, Palo Alto, Redwood City, San Mateo and San Francisco. Some sections were converted to electronic format here. The Berkeley story is contained in a limited reproduction of Chapter 3--a must-read for all tunnel proponents and opponents. If one were to crudely apply the lessons from BART vs. Berkeley in the 1960s to CHSRA vs. peninsula communities in the 2000s, the key takeaway would be this: if peninsula cities wanted tunnels, they would need to take matters of design, cost estimation and financing into their own hands now because the CHSRA would not help them--and could indeed actively undermine them while pretending to help. The Authority would know that tunnels are expensive, and that ceding even an inch of tunnel to one community could trigger demands from many other communities up and down the peninsula and even state-wide, weighing heavily on the financial viability of the project. This is all hypothetical, of course; the CHSRA in the 2000s may not compare to the fascinating tale of BART in the 1960s. Then again, the overall dynamics of the situation are too similar to ignore. Would expecting a different outcome make one a fool?